Danganronpa V3: Killing Harmony (ニューダンガンロンパV3 みんなのコロシアイ新学期) is a popular video game for PS4, PS Vita, and Microsoft PC that released in 2017. 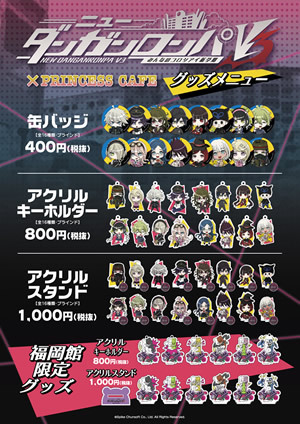 This limited time café collaboration will be held with Princess Café at 5 locations around Japan during various different times between 11/17/18 - 2/17/19. Please be sure to check the holding period of the location you plan to visit. Reservations are not necessary to visit this café. Customers who order off of the collaboration food & drink menu will receive an original coaster at random per order. There are 16 different designs but you may not choose your design and benefit will only be handed out while supplies last. This collaboration will be held at 5 location(s) around Japan. Please be sure to verify the date, time, location, and reservation status of the café closest to you before visiting as these details may differ from location!